Hanway's Act survived the 1834 Poor Law Amendment Act and unions continued to send their children to privately run establishments, the largest of which were Mr Aubin's at Westow Hill, Norwood which opened in 1821, and Mr Drouet's at Surrey Hall in Tooting. The Act was however repealed in 1844 by which time the Poor Law Commissioners were attempting to persuade groups of unions to set up District Schools. By 1850, only two private establishments remained in operation for taking paupers under contract from London workhouses. Both were located in Margate in Kent and were permitted to continue because they provided medical and convalescent care. One catered for adults while the other, the Metropolitan Infirmary for Children, took children from unions all over London. Under the 1834 Act, Poor Law Unions were required to provide at least three hours a day of schooling for workhouse children, and to appoint a schoolmaster and/or schoolmistress. The children were taught "reading, writing, arithmetic, and the principles of the Christian Religion, and such other instruction as may fit them for service, and train them to habits of usefulness, industry and virtue". Ongar Workhouse School Block, 2000. Boards of Guardians were, however, sometimes reluctant to spend money on even the most basic equipment such as writing slates. Occasionally, it was even questioned whether pauper children even needed to be taught basic literacy. This was partly justified by the 1834 Act's principle of "less eligibility" which, it was argued, demanded a lower quality of education than would be enjoyed by the children of those of modest means outside the workhouse. In 1836, the Guardians of the Bedford Union suggested a compromise by teaching workhouse children to read but not to write. Likewise, in 1839 the Guardians of the Pershore Union decided that "it is quite unnecessary to teach the children in the union workhouse the accomplishment of writing" Crompton (1997). However, they were were forced to change their minds in 1844 when the Parish Apprentices Act demanded that "pauper apprentices be able to read and write their own names unaided". Teaching pauper children to read and write would, in the long run it was argued, make them less likely to need poor relief. Although authors of the 1834 Royal Commission Report had initially recommended separate establishments for different types of pauper (children, the able-bodied, the elderly), the "general mixed workhouse" rapidly became the norm. However, a few unions did begin to set up separate schools which provided accommodation and education for pauper children away from the physical conditions and "malign influence" of the main workhouse. Early separate schools were often in former parish workhouse buildings that the union had inherited, for example the Stepney Union's Limehouse School and the Edmonton Union's Enfield School. Lambeth had a school on Elder Road in West Norwood that dated from 1810. A prominent proponent of separate schools was Dr James Kay (later better known as Sir James Kay-Shuttleworth). Kay took a particular interest in Mr Aubin's privately run school at Norwood which had over 1,000 residential pupils largely taken from Metropolitan poor-law unions. After the introduction of "industrial training" (handicrafts for the boys, domestic training for the girls), the banning of corporal punishment, and improved conditions for teachers at the school, great improvements were obtained in the children's performance and morale. As a result the school became a much trumpeted showpiece of public education. Kay proposed a grandiose scheme for establishing a hundred similar "District" schools across England and Wales each accommodating around 500 children who would be separated from what he saw as the polluting association with the adult workhouse inmates. In such institutions, he claimed, poor law children "would not be daily taught the daily lesson of dependence, of which the whole apparatus of a workhouse is the symbol... the district school would assume a character of hopefulness and enterprise better fitted to prepare the children for conflict with the perils and difficulties of a struggle for independence than anything which their present situation affords." Another influential model was the Bridgnorth Union's school in the village of Quatt. The school, which accommodated around eighty children, was set up in a large house on the estate owned by Bridgnorth Guardian Mr. Wolrych Whitmore. As well as receiving a basic classroom education, the boys cultivated the land and managed farm stock, while the girls did the housework. The provision of such industrial training which would equip children for future employment was taken up by many other unions. As well as agricultural and hortucultural work, the range of training gradually expanded to include trades such as carpentry, tailoring and shoe-making. Larger separate schools also developed activities such as drill, swimming, and the formation of school bands. Several early examples of large separate schools were located in the north of England: the Manchester Guardians' school as Swinton (1843), the Liverpool Vestry's Kirkdale Industrial School (1843-50), and the Leeds Union's Moral and Industrial Training School (1846-8). Outside London, separate schools were also established by the poor law authorities at: Brighton, Cardfiff, Chesterfield, Cockermouth, Halstead, Hartismere, Merthyr Tydfil, and Oxford. The Oxford separate school at Cowley Fields, known locally as The Poplars, dated from the early 1850s. The ability to provide industrial training in a much wider range of subjects than would be feasible in individual workhouses. Overall savings in the cost of staff, furniture, books etc. However, outside London, only a handful of School Districts (Reading & Wokingham SD, Farnham & Hartley Wintney SD, South East Shropshire, Walsall & West Bromwich) were ever formed. The Poor Law Board were a little more successful in establishing schools in School Districts in Metropolitan London. In 1849, three School Districts were formed (Central London, South Metropolitan, and North Surrey) which covered ten of the capital's thirty unions. However, a severe blow to the image of large pauper schools occurred in the same year when an outbreak of cholera at Mr Drouet's School at Tooting resulted in the deaths of 180 of its 1,400 resident children. Despite ongoing efforts by the Poor Law Board, it was not until 1868 that three further School Districts (Forest Gate, West London andFinsbury) were created, although Finsbury was dissolved the following year. The Kensington & Chelsea School District was established in 1876 followed by Brentwood in 1877, the latter being dissolved in 1885. North Surrey School from the south, 1850. Central London District School at Hanwell, school dining hall. By the 1890s, London had five District Schools in operation covering fifteen unions, together with eleven individual separate schools at Bethnal Green, St George-in-the-East, Hackney, Holborn, Islington, Lambeth, St Marylebone, Mile End, St Pancras, Strand, and Westminster. Two Metropolitan parishes — Hampstead and Bloomsbury St Giles — had no schools of their own, with Hampstead sending its children to the Westminster separate school at Tooting, and St Giles to the Strand separate school at Edmonton. By 1900, the Kensington & Chelsea School District and the Shoreditch Union were operating cottage homes sites rather than large schools. A map of London's School Districts and Unions is shown below — click on the map for more information on a particular area. © 2004, Peter Higginbotham. Based on ddata from Great Britain Historical GIS Project via UKBorders. Instruction of children at the South Metropolitan District Schools in Sutton, 1872. 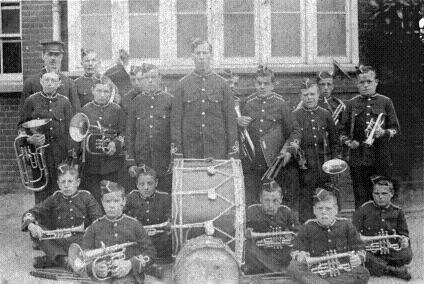 Many District Schools had a school band through which, for boys with a musical aptitude, could lead to a career in the army as a military bandsman. A school band from the early 1900s. Lambeth Norwood School residents, c.1908. District schools, or "Barrack" schools as they were later stigmatised, were the subject of much criticism. Not only were they expensive to operate, but also proved to be a breeding ground for various infections conditions such as ringworm and an ophthalmic condition known as "the blight". Discipline in the schools would now be considered harsh, as revealed by the accounts of ex-pupils such as Charlie Chaplin. Chaplin's autobiography recounts the story of a boy of fourteen trying to escape from the school by climbing on to the school roof and defying staff by throwing missiles and horse-chestnuts at them as they climbed after him. For such offences there were regular Friday morning punishment sessions in the gymnasium where all the boys lined up on three sides of a square. For minor offences, a boy was laid face down across a long desk, feet strapped, while his shirt was pulled out over his head. Captain Hindrum, a retired Navy man, then gave him from three to six hefty strokes with a four-foot cane. Recipients would cry appallingly or even faint and afterwards have to be carried away to recover. For more serious offences, birch was used — after three strokes, a boy needed to be taken to the surgery for treatment. Having inspected this school for thirty years, I can bear my testimony to the fact that there has never been any prevalent disease in it, and that the children have always been the healthiest I have seen... as it is admirably managed by the present head-master and mistress. The building has been somewhat improved by a partial alteration, but it still continues to be substantially nothing but an old, rough farm-house, with small windows and whitewashed walls, a small and dark schoolroom, whose ceiling of rough boards and beams is only ten feet above a floor of coarse bricks, worn uneven by constant use. The instruction of the children and the management of the establishment are entrusted to a master and mistress, who are in every respect suited to the duties they have to perform, as they make the best of the difficulties occasioned by the imperfections of the building, instead of complaining of them and making them an excuse for shortcomings in regard to instruction. The boys are taught shoemaking, and agriculture by a man who has been there as long as I can remember, and the girls laundry work, etc., by a woman who is also an old officer. I am convinced that this humble establishment has done as useful a work in rescuing the children educated in it from pauperism, as if it had been built in a more costly manner, and lavishly provided with all the conveniences to be found in the newest district schools. The term "Industrial School" or "School of Industry" is one that, confusingly, was used at different times for somewhat different institutions. Early examples, such as the one at Faringdon in Berkshire, predate the 1834 Poor Law Act. Such establishments, run by the parish, provided pauper children with training, mostly in domestic and agricultural skills. Faringdon's 1833 Female School of Industry, 2000. As noted above, some workhouse and district schools were also referred as industrial schools, for example the Manchester Guardians' school as Swinton (1843), the Liverpool Vestry's Kirkdale Industrial School (1843-50), and the Leeds Union's Moral and Industrial Training School (1846-8). Examples in London included the Shoreditch Industrial Schools (1852-4) at Brentwood and the St Pancras Industrial Schools (1868) at Leavesden. However, after the passing of the 1857 Industrial Schools Act, the term Industrial School was primarily used for establishments used to house vagrant, destitute and disorderly children who were considered in danger of becoming criminals or who were in contact with prostitutes. There were around 30 such 'certified' Industrial Schools in England by the end of 1865. The 1876 Elementary Education Act led to the founding of Day Industrial Schools and Truant schools. For children who actually had committed criminal acts, Reformatory schools were established. Perhaps surprisingly, the great majority of Industrial and Reformatory schools were privately operated although subject to regular official inspection and licensing. By 1914, there were 208 schools for juvenile delinquents, of which 132 were residential industrial schools. In 1933, the remaining industrial schools became known as Approved Schools. For a more information on this topic, see the separate pages on Reformatories and Industrial Schools. Crompton, Frank Workhouse Children Sutton Publishing, 1997. Neate, Alan R The St Marylebone Workhouse and Institution, 1730-1965. St Marylebone Society, 1967. Ninth Annual Report of the Local Government Board , 1880. Thanks to Michael de Monti whose grandfather Henry Francis Aloysius de Monti (first on left of back row in above band photo) was a music teacher and drill master for the Metropolitan Asylums Board in the early 1900s.